'Catching Hell': The Cubs, Steve Bartman, And Mass Media's Momentum ESPN Films uses sports documentaries to look at mass culture, and tonight's Catching Hell, about Cubs fan Steve Bartman, presents a terrifying story of mass hysteria and media goading. A screen grab from ESPN Films Catching Hell, Alex Gibney's look at the story of Steve Bartman. The best documentaries to come out of what was the ESPN 30 For 30 series and is now just ESPN Films are not necessarily the ones that are pure sports stories. They're the ones that have used sports as a way to look at mass culture, including The Two Escobars, which wove together drugs and soccer, and the outstanding June 17, 1994, which followed the many big sports stories that broke on the same day O.J. Simpson made his famous run in the white Bronco. Another perfect example is Catching Hell, an excellent film premiering tonight in which filmmaker Alex Gibney revisits the story of Steve Bartman, the Cubs fan who became Chicago's Public Enemy Number One after being blamed for interfering with a catch and dashing the Cubs' hopes of advancing to the World Series. Of course, had fielder Moises Alou made the catch, it would have been the second out in the eighth inning, not the final out of the game. Of course, Bartman didn't make the Cubs go on to give up eight runs. Of course, that particular play was a foul ball that advanced no runner and gave up no run in and of itself. 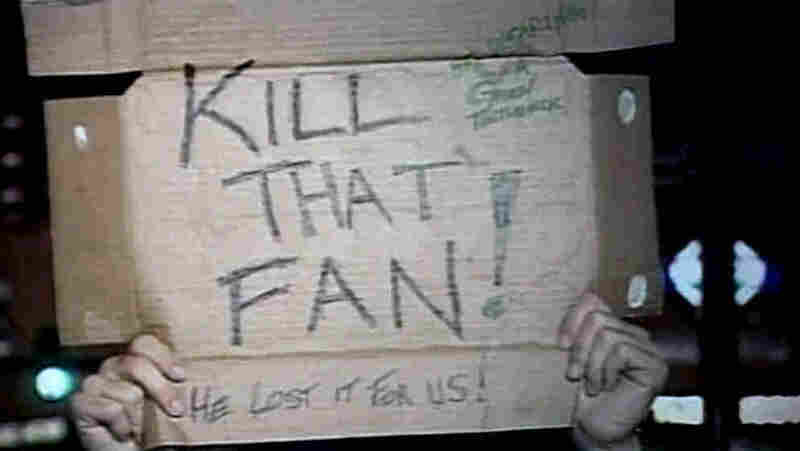 Of course, several other fans did basically the same thing Bartman did. None of that mattered, though — Bartman was vilified to the point where he was escorted from the game by security and later received police protection. He issued a public apology, but has never really reemerged. Gibney is partly interested in reexamining the Bartman story itself, and in exonerating a man who never, ever should have been given so much responsibility for the loss of the game, let alone the loss of the series. In that sense, Catching Hell is a nifty piece of investigation, playing tape over and over until you see beyond a shadow of a doubt that he was not the only person who did what he did — Alou himself recalls being interfered with by "four or six" hands, not one guy. But more than that, Catching Hell is a story about false narratives, the speed with which they develop, and the utter impossibility of turning them around once they've taken hold. That part of the film is what's genuinely frightening. Gibney reconstructs all the small steps that made Bartman into the assumed villain, none of which seem all that bad on their own: the way Alou immediately reacted, the way the broadcasters called the game, the way the camera returned to him over and over, the way his friends abandoned him, the way Cubs' manager Dusty Baker angrily speculated after the game that maybe Bartman was "a Marlin fan," and even Bartman's unusual appearance — glasses, Walkman ... you couldn't miss him. The film argues that Bartman was treated utterly unfairly, but acknowledges that no one person at any one moment meant to treat him that way — with the exception of an idiot who came down from his seat to throw a beer at Bartman, and who still believes years later that he did nothing wrong. The rest of it was just momentum. It sort of happened, and then it could not be undone. Lots of these people wanted their reactions back, or later wished they'd had a moment to think and perhaps handle it differently. Nobody meant any harm. The broadcasters thought they were telling the story of what they were seeing. The cameras were showing what people were interested in, which was Bartman, over and over and over. There's no accountability, because this kind of a story emerges as if it's been conjured, bubbling up from the bottom rather than imposed with malice by anyone. You can't look at sports scapegoats without Bill Buckner, so Gibney begins by looking at the 1986 incident in which a ball dribbled between Buckner's legs and helped contribute — after a wild pitch, after a defensive collapse, after a lot of other developments — to Boston losing the World Series to the Mets. While the Buckner story is different, it's a critical piece of the puzzle, because at least Buckner was on the team. At least Buckner was one of the guys whose job it was to make the win happen. Bartman wasn't. Bartman was a guy in the stands who, at worse, made a bad split-second decision at the same time a lot of other people would have done exactly the same thing — and, in some cases, did. This, quite literally, could happen to you. Bartman may have screwed up, but that is utterly dwarfed by the degree to which he was in the wrong place at the wrong time looking the wrong way. Catching Hell seeks fundamentally to untangle this insanity. How can people believe in curses? How can they blame a fan for the team giving up eight runs? How can they not understand that dealing with setbacks that may be out of your control without utterly collapsing is a legitimate and fair part of athletics, and if you can't handle it, that's on you? The intriguing questions go on and on: the internet played a role in the vilifying of Bartman, but it wasn't quite as robust as it is now. Had online been as ubiquitous then as now, would Bartman have been in worse shape, or would someone have used their video editing skills to point out the other people who did what he did, or mounted some other kind of defense? You really don't have to care about sports to get a lot out of this story about perpetual motion and lack of accountability in mass culture, where absolutely nobody has to mean to be unfair for massive, overwhelming unfairness to take hold to the point where it can literally ruin someone's life. There are moments of great poignancy here, and Gibney draws a marvelously insightful conclusion about whether Chicago has or will ever forgive Steve Bartman that is worth your time just to reach.